2 teams set up in a 2-3-1 formation in a scrimmage like scenario. 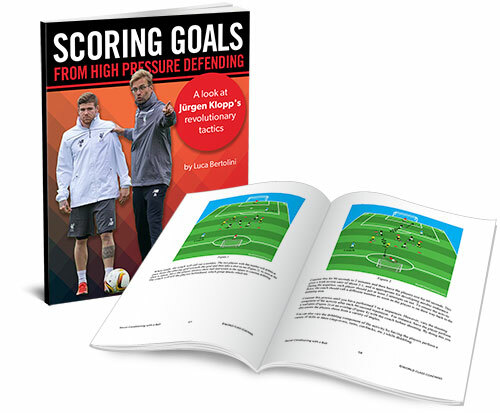 The aim for this session is for your team to work together defensively by stifling forward progression of the opposition and frustrating the other team into backwards and sideways passes until they become frustrated. Your team must stay close together to stop penetrating passing lines into the feet of players further up the field. They cut off angles so the only available pass is one of backwards or sideways. The defending team does not have to sit right in front of their own goal for this tactic to work. It is more effective to perform it in the middle of the field. As the opposition pass wide, the defending wide midfielder gets across to pressure the player on the ball so they can’t move forwards, the rest of the team slides across, compacting that side of the field, leaving the opposite wing open. The striker drops down to stop any balls into the center of midfield. 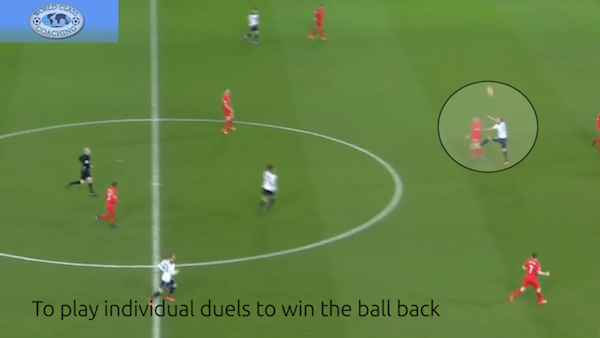 As the ball travels back to the CB the striker of the defending team presses the CB to force them to make a quick decision, again not allowing forward penetration. The obvious pass is sideways to the free CB. The team again slide into the middle to compact the area directly in front of or around the ball. Now we have a little change of shape, because we don’t want to be so compact that passes out wide can break the defensive lines. Again the focus is to stop forward penetration by cutting off forwards passing options. As the ball travels to the opposite CB, the striker drops down to stop passes into the CM. The wide midfielder stays narrow to stop passes into the striker’s feet. The FB comes across to pressure the WM when they receive the ball and the CB and opposite WM slide across to cover and keep defensive shape. As the ball arrives to the WM the FB is close to Pressure them, the WM has dropped down to block the pass into the striker’s feet again and striker drops to stop passes into the CM again, this leaves a pass backwards to the CB as the only pass available. Players need to understand that they are working as a team to stop forward progression and not become individual and start to run all over the field. 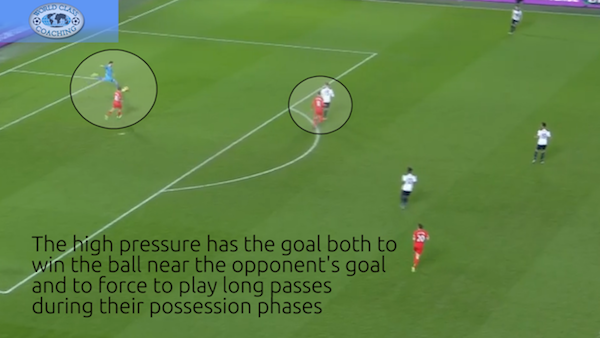 If players can win the ball when pressing then absolutely go for it, but the aim is to frustrate the other team going forward and giving the ball away by trying passes that are not on. When the other team wins possession the defending team aims to frustrate and stop forward progression just like they experienced.